Sarah and I started our day with breakfast at Bob Evans. We headed to Cedar Point at 11:00. We got early rides on Raptor and Millennium Force. This morning was the busiest early entry ERT I've seen. Once the park opened to the general public every ride instantly had a line. With the temperature around 80 degrees the crowds were very impressive. Later in the afternoon Sarah and I rode the space spiral to get a look at the parking lot. As far as we could see the parking lot was completely full. With a line on every ride and very long lines on the popular ones we decided to take in some shows. But it was sort of our plan all along to see some of the Halloweekends shows. We saw Sideshow - A carnival of Magic at the Jack Aldrich Theatre. Magic show filled with music, dance, costumes and comedy. I couldn't figure out how they did some of the tricks. It was one of the best shows I've seen at any park. At the Good Time Theatre we saw The GoodTime Ghouls - A Halloween Hullabaloo!. It was a high-energy music revue of Halloween hits. The show was done well with good performances, good effects and a great selection of tunes. Our last ride of the day was on Blue Streak. As we rode the coaster along Cedar Point Drive, I could see more cars parked in the grass along the side of the road. I have never seen the park this crowded. 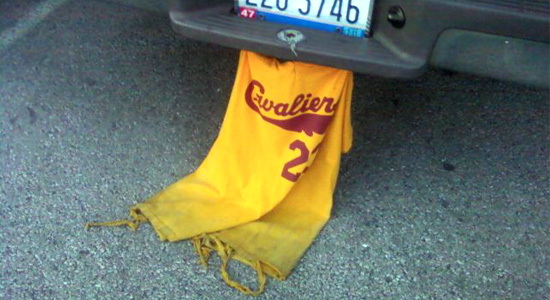 We spotted a former LeBron James fan on our way out of the Cedar Point parking lot.